Normally hydrogen fires are not extinguished until the supply of hydrogen has been shut off due to the danger of re-ignition and explosion. Personnel who work around hydrogen should be trained in the characteristics of hydrogen fires and proper procedures for dealing with them. 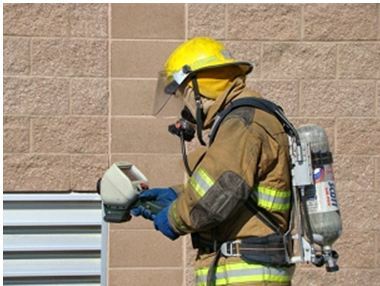 A hydrogen fire is often difficult to detect without a thermal imaging camera or flame detector. Let a gaseous hydrogen fire burn, but spray water on adjacent equipment to cool it. Be careful not to spray pressure-relief devices, since ice formation could make them inoperable. Short_hydrogen_prop_v2.mov (mov, 7.4 mb), filmed by ImageWorks for DOE.